SPA™ is our enterprise class agentless imaging traffic analyzer that captures all images appearing on a Windows based print queue. The print queue can be 1) a local Microsoft Windows based device, or 2) a remote queue on a MS Windows-based print server (the system is device agnostic for initiating devices when capturing image traffic via a print server). SPA™ does not simply track imaging but correlates information collected from multiple points within the scope of the imaging transaction. SPA™ depicts print analysis visually in addition to being reported through the reporting system. SPA™ includes an executive dashboard with stoplight indicators. It inventories and maintains historical and configuration information on all imaging transactions and their generating devices. Inventory includes the initiating workstation, underlying infrastructure involved in the delivery of the transaction, print servers if applicable and end imaging devices (local or network attached). Symphion Concierge Teams use SPA™ to deliver our Print (Tethered) Information as a Service™ (Monitoring) solution to eliminate manual reads and to analyze departmental print including high paper usage. 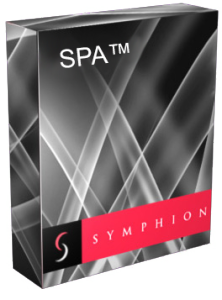 SPA™ is deployed on and utilizing Microsoft technologies.